The DGW file manager allows for the importation of data files used by DGW. 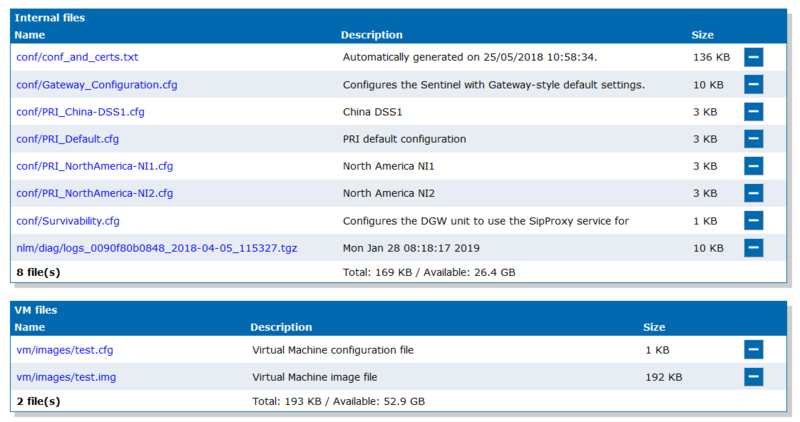 When a DGW Mediatrix unit is purchased, several preset files are already present in the Internal files table (Management /File ). these can be the default rulesets, a configuration script, etc. However, it is possible to import and export files (for example to import the configuration scripts that are applied on similar units). It is possible to import a file either by using an URL or through a Web browser. Media5 strongly recommends to use an HTTPS access. Closing the unit Web page will stop the transfer. Web Browsers do not always display a progress indicator, be cautious not to accidentally abort the file transfer. Transfer speed depends on connection speed, therefore transfer can take several minutes. Free disk space in computer must be at least equivalent to the size of the imported file. Anti-virus programs sometimes abort large file transfers; consider closing it. This option is not available on the Mediatrix 4102. In the Import File Through URL table, from the Destination selection list, select . In the URL field, enter the url where the file is located (supports HTTP/HTTPS/TFTP/FTP). Enter a username and Password . A factory reset will remove the file from the Internal files table. If you are not using HTTPS, click Activate unsecure file transfer through web browser located at the top of the page. In the Import File Through Web Browser table, from the Path drop-down list, select . Click Browse , and locate the file. In the Web interface of DGW, go to Management /File . Click located on the same line of the file you wish to remove. A message will be displayed asking: Are you sure you want to delete this file? , click OK . The file will no longer appear in the table.